Insurance, not just for those under 26. With the CND underway and news about ACA/Obamacare, A lot of healthcare related issues are on the table, nationally and internationally. If you’re interested in keeping tabs on what’s going on with drugs/pharma and all things narcotic internationally i highly suggest checking out the blog, or if you want something easier to digest check out the twitter hashtag #CND2015. Healthcare as an employee (which is the most common way about it in the united states). Insurance and compensation are part of the bargaining agreement between you and your employer when you start working for them. Insurance is a weird thing, but ultimately the employer is giving you a discounted insurance plan in lieu of other financial compensation. There are some companies that will pay you to opt out of their insurance, because it’s cheaper for them as long as they meet their units needed for group discount. So when you get handed a dozen options from your HR department come fall, I’m sure you’ve noticed a few plans are ridiculously expensive. In some circumstances companies have executive plans which cover more than the options you were given. Your pay-grade usually determines the allowance you get to buy a healthcare plan. It would be prudent to know that the ACA is the first real legislation to present a progressive tax system that extends to this compensation. Why should you give two shits about all of this? Understanding benefits negotiations is as essential as negotiating your wages. Since it’s such an information disparity, most potential employees do not know what they’re going to get until they’re hired. It’s always good to know what insurance plans are offered by a company and how they compare to other options. It’s also often the case that you may find that your doctor is no longer covered when you switch employers, even if it looks like the same plan. That’s because Healthcare plans usually have a list of doctors within their program. There are some medical groups that have associated healthcare insurance to alleviate this issue, and in a sense compete over your care without your say. Health insurance since the early 80s has been a rapidly growing part of paying for a hospital bill. Insurance is and always will be an all or nothing deal. Whenever Insurance becomes part of a marketplace it sets group rates and raises prices for those without insurance. This alongside Pharma patents, costs of medical equipment, and a disturbingly small pool of workers has helped to create some of the unusually high medical costs we see today. Because healthcare insurance has become part of an employee’s compensation, healthcare is more often the primary means of payment for most medical groups. The employers bargain with insurance companies for rates and plans, those insurance plans present proposals to medical groups. For the most part the conversation regarding what you pay for healthcare is never up to your needs, and the services you choose from are what the companies have agreed upon. Limiting your choices as a healthcare consumer. Exchanges allow for consumers to pick plans they would have otherwise never seen. Their major limit is their geographic region. If you’ve used Covered Ca, Healthcare.gov or even a private exchange you’ve seen how much better many of those options can be. Payment without insurance is always higher, and if you’re savvy you might be able to negotiate a payment plan with the hospital’s billing and/or finical assistance dept. But regardless you’ll pay more. This is one of the fundamental problems the ACA attempts to alleviate. The reality that if you’re employer doesn’t give you benefits(usually not fulltime), underemployed, or hanging income-wise out between 17k and 40k per year: you simply go without insurance, and risk falling into serious debt/health problems when something bad happens health-wise. It also alleviates the issue of employer based competition by opening up the markets to consumers via exchanges. In our modern society, being so close quarters and risking illness/injury daily, it is necessary. So… I guess I should get to why I’m on this subject right now. Well, the reason I’m talking about this is because this last week the Congressional Budget Office announced its projections for 2015. The ACA (Obamacare) has a very interesting track record. While there are a lot of disagreements as to why these changes are occurring and how it affects us, esp. with King V Burwell presently in the Supreme Court. To insure our health as a nation, the subsidy is an important factor alongside the exchange. What’s noted here are some relevant facts: Affordable Care Act(Obamacare) will have lower projections in terms of cost and number of people covered using the exchange. Here’s the neat bit of all of this, since we’re halfway between a census it’s hard to have spot on population projections, but 6 million less non-elderly people than projected is a doozy. With projections the relationships between the numbers are important. The goal of the ACA was the lower the number of uninsured. Expanded healthcare to 26 under parents plan, lower of full-time work requirements, the subsidy/exchange program, and 400% poverty wage definitions helped this relationship are all parts of the ACA that help accomplish this. 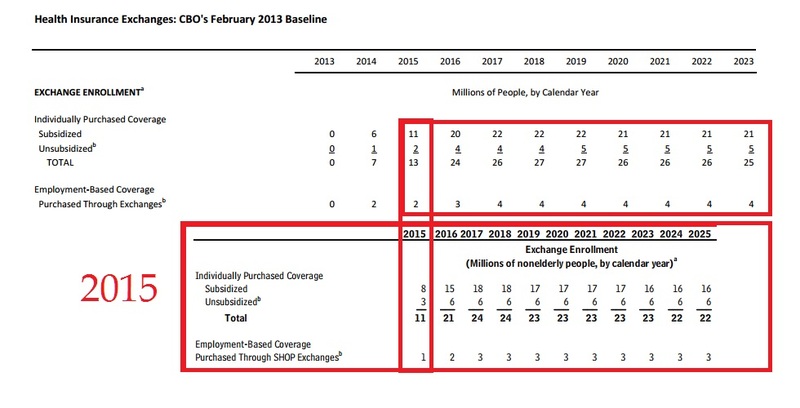 As Table 2 illustrates there is a drop of enrollees in exchanges and Medicaid. There is also an overall shrinkage of about three million people. Two things will change these numbers over time: As states allow their constituents to use exchanges, and as signing up through an exchange becomes more user-friendly we’ll see better reflections. While politicians bark at each other, the key to keep in mind is the relationship between the numbers. Those signing up for exchanges vs. less uninsured is nearly the same (13/20) 65% for 2013 projections while (11/17) about 64.471% for real 2015. This relationship implies the success/failure of the exchanges as it relates to helping those who are without insurance, in comparison to projected numbers. The numbers are not much different..
Those benefiting from the ACA’s exchange and expanded Medicaid definitions also are very similar from 2013 projections (20/24) about 83.33% while 2015 real (17/21) about 80.95%. 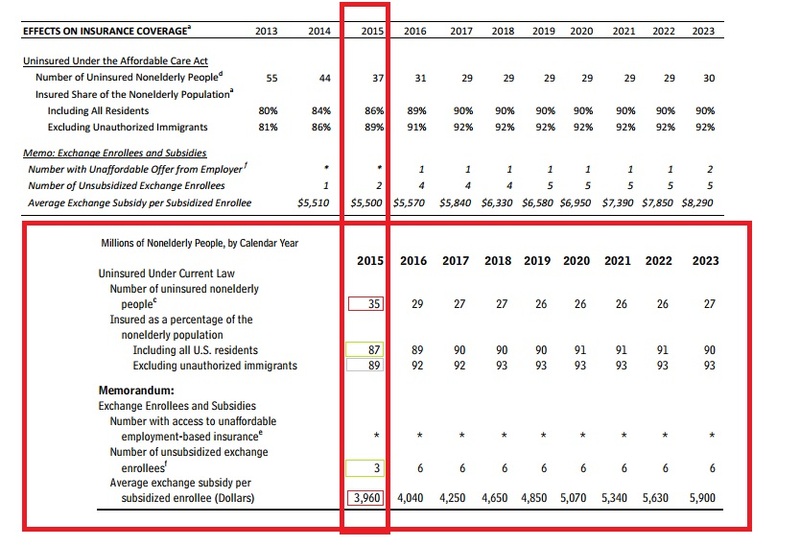 This relationship implies the success/failure of the ACA’s exchange program and expanded Medicaid definitions, in comparison to its projected numbers. Within one year, a little more than 80% of the United States’ uninsured population gained insurance they otherwise wouldn’t have. It’s actually more than that, but the table 6 has more data to better reflect that question. This number is a close expectation of the direct effect of the program. These are the big numbers most people are talking about regarding the success of the ACA/Obamacare. that overall Costs are down. Woohoo! Just Kidding. It’s really not that big a deal, spending allocations are very hard to project without a few years of historical comparisons. Again, Table 4’s numbers reflect the overall shrinkage in projections for 2015 vs. actual. This is just a more in depth table of where that exchange enrollment from table 1 looks like. What’s important to note is that more people signed up who are unsubsidized than expected. Realistically this implies a success of offering exchanges to consumers, rather than the importance of the subsidy. This implies that states not allowing exchanges (state by state means that it’s plans better reflect their constituents) penalize their residents by lack of consumer choice at the very least. If you want to count a huge success of comparative projections… it’s right here: Spending per enrollee dropped, by $1,540 per year. It cost 30 billion dollars less than expected for its subsidies. The huge drop in per price enrollee eliminates the 3 million less enrolled(than projected) as a being a major factor in that cost reduction. Which means that as the program grows, it will cost less than expected overall. Table 6 shows clearly and definitively that an overwhelming majority of uninsured population now has coverage. Success is hard define though, because yes, this is a goal of the ACA, however, it’s still missing a lot of people. The trouble with a lot of this is that there were no clear “Success” guidelines given to the general public. What a politician says to the people, and how s/he defines a metric are often different. The more flowery language gives a program lots of room to fail or succeed. But as we’ve all seen, it also opens the door for serious slanted criticism, and interpretation. So instead of speculate what the actual goals of the program were, let’s look at the impact. There are two million less uninsured than projected, and one million more enrollees did not use subsidies. These factors helped keep the percentages about the same as projected. As the number of people who are insured rise, it’s going to affect what those without it are paying nationwide. By using healthcare insurance, their rates are already bargained and while they are the patient they’re not entirely the consumer at the hospital. e.g. If a thousand people pay rates, each one of them has a voice. Two hundred of them band together to bargain collectively under the name of insurance. Collective bargaining allows groups within that thousand people to command better rates by demanding a certain price. Because the hospital wants a guarantee that it can get those two hundred people lower rates can be negotiated. This in turn can push prices higher for everyone else. When the bargaining groups make up a good chunk of the market it can help push costs even higher. Especially since, the bargaining groups are usually stuck with an exclusivity deal with that hospital. As more groups arrive and become more of the market, those who aren’t in the groups can face significantly higher rates than they used to. Eventually there is a point at which the groups will command the market together, at this time they will be able to break exclusivity either the group will seek more hospitals to grow its membership and/or because the hospital will try to compete with other hospitals. There’s not really a set point where this can happen, the number of competing hospitals, and area employers can play a large factor in the use and availability of buyers respectively. The impact of the exchange will allow for more insurers to create more diverse products. It has and will continue to compete among pools of people who before were part of bargaining groups (usually through an employer) or simply individuals who didn’t have access to the insurance(be their rationale to go without: financial motivation, lack of knowledge or what have you). What the ACA/Obamacare has created is a marketplace for competition, and as the percentage of insured Americans increases so will the prices for those without it, which will encourage them to be part of it. Referring back to table 6, there is one area where the ACA/Obamacare is assuredly a success. It’s price per enrollee is much less than expected. Keep in mind that the projections for the uninsured population being 2 million less does factor into that, but it’s not enough to cause a drop that large. The ACA/Obamacare has helped millions of people have access to healthcare, and it’s not as expensive as it was projected. In terms of efficacy and impact this isn’t government cheese, it’s a marketplace where you can afford to choose a health insurance program.